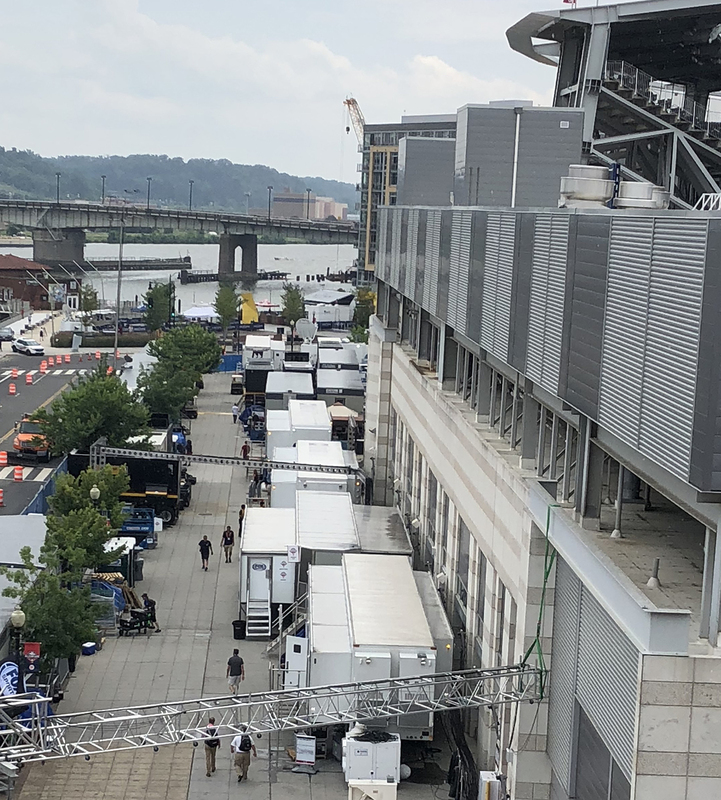 The Fox Sports and MLB Network All-Star compound was an all-Game Creek affair at Nationals Park this week, as the mobile-facilities provider rolled out a total of 10 total trucks in Washington, DC, this week. Game Creek’s Riley Helsen (left) and George Bailee on hand at the MLB All-Star Game in D.C. 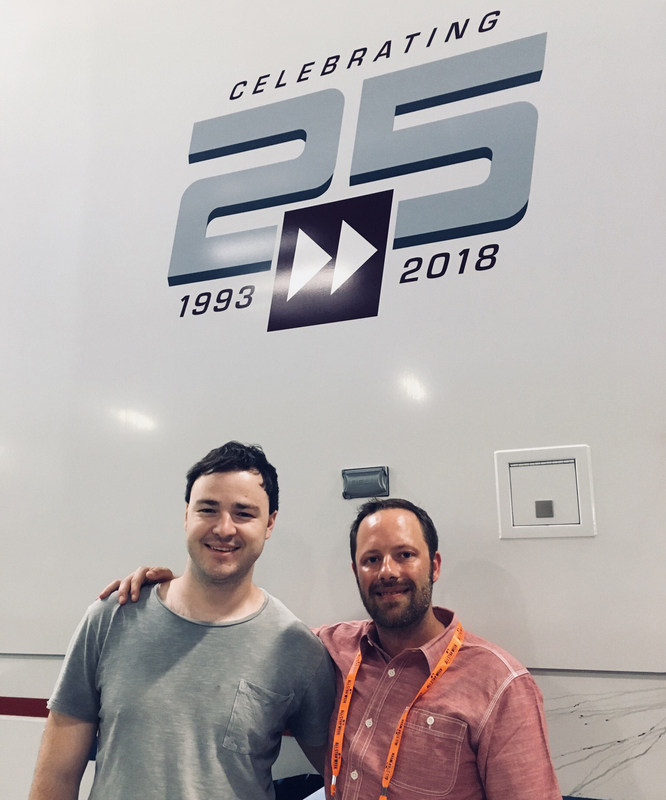 Thanks to a reshuffling of the USGA summer tournaments calendar, Game Creek Video’s IP-based Encore mobile unit (A, B, and C units) – home to Fox’s U.S. Open and NFL A-game productions – made its first All-Star appearance. The primary control room inside the Encore B unit handled the main game production, while a second adjacent production area was created in the same truck to serve the onsite studio shows. The studio show’s production team shared a 2ME Grass Valley Korona switcher panel that was connected to the same K-Frame switcher being used by the main game production, so all sources were available to either team. With dual tally configurations, the camera operators also knew when their feed was being used in the respective telecasts. In addition, Encore’s ultra-robust IP-based infrastructure allowed Fox to license all 12 of its Sony HDC-4300 primary game cameras for high-speed — six at 6X slo-mo and six at 2X slo-mo. Game Creek Video’s Edit 1 and Edit 2 were also on hand, housing a variety of Fox operations and vendors. MLB Network rolled out seven mobile units to handle this parade of shows: Game Creek Video’s Maverick (for All-Star World Feed Tuesday and the All-Star Futures Game and Armed Services Classic on Sunday), Riverhawk (for MLB Tonight, High Heat, and Intentional Talk studio shows), Webby (Red Carpet Show on Tuesday), Edit 3 (primarily for at-home–production needs), Edit 4, and Freedom (VR HR Derby). The massive growth of MLB Network’s operation at All-Star this year – largely due to it taking over production of many of the live-streaming productions – meant that Game Creek’s role with the league also grew. In addition, Game Creek provided the mobile unit for the World Feed this year – bringing MLB’s entire operation under the Game Creek umbrella with a total of four trucks. Game Creek paired its Maverick and Edit 4 mobile units with Maverick serving the World Feed and Futures Game production and Edit 4 serving as a REMI/at-home-production suite for live-streaming productions, which heavily leveraged control rooms at MLB Network’s Secaucus, NJ, headquarters. Meanwhile, Game Creek Video’s Riverhawk and Edit 3 trucks (home to the weekly MLB Network Showcase production) served as home to MLB Network’s studio shows. Game Creek and MLB Network also continue to delve further into using the EVS Xplore web-browsing interface and XSquare file exchange solution, which is used regularly on MLB Network Showcase games throughout the year. At All-Star, for the first time, they deployed Xplore on three trucks with a record number of channels and married all three units together with the operation back in Secaucus.